Ivan Ronda studied under Maestro Luigi Toja at the Giuseppe Nicolini Conservatory in Piacenza, graduating with the highest distinction in piano, organ, harpsichord, choral and orchestral conducting; he also received an honorary diploma of merit on completion of his eighth year of advanced study and went on to attend masterclasses in piano and organ, notably with the great French virtuoso Jean Guillou. Central to his repertory are the great works of J S Bach, Mozart, Reger and Liszt. In 2004 Ivan Ronda founded the Trio Barocco (with soprano Emi Aikawa and baroque trumpeter Alberto Bardelloni), touring as far afield as Japan and the USA; the ensemble has recorded a CD of music by Galuppi, Sacrlatti, Bach, Purcell, Viviani and Handel for the label, Sheva Collection. Ivan Ronda has toured prestigious venues in the United Kingdom, performing at King’s College and St John’s College, Cambridge, St Paul’s Cathedral, Westminster Abbey, Westminster Cathedral, St Chad’s Cathedral, Birmingham and Coventry Cathedral. In 2005, he visited South America, performing in cathedrals and basilicas in Montevideo and Buenos Aires, where his Metropolitan Cathedral recital attracted an audience of 1000 people; his recordings have been broadcast on RAI International and Radio Classica Bresciana. As an organist, Ivan Ronda is recognised for his interpretations of the music of Johann Sebastian Bach, on which he is an acknowledged authority, bringing solid technique and using the colours of the organ to reveal the spirit and personality of the Baroque period’s master of counterpoint. For the French label Fugatto, Ivan Ronda has recorded a Bach CD on the great Tamburini-Bonato organ in the Cathedral of Abano Terme, and a Bach double-CD on the Silbermann organ of Arelsheim, Switzerland – both recordings were acclaimed in the international music press. The present recording of music by Bach is the first to be made by an Italian organist on the great Baroque organ of the St. Johanniskirche, Lüneburg, an instrument on which Bach himself was nurtured, played and composed. Ivan Ronda has guest conducted at the Teatro Grande di Brescia, including the traditional Christmas concert, and has performed as accompanist to the saxophone and clarinet player Gianni Alberti, and the tenor Paolo Antognetti. In 2009 he took up a music teaching post at the Sacra Famiglia school in Soncino, and in 2010 at the S. Angela Merici school in Manerbio; his students form a significant presence in Italian music academies and conservatories. 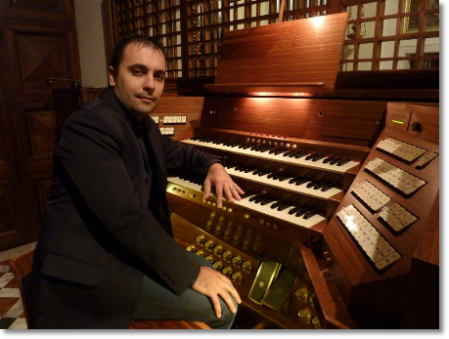 Ivan Ronda is organist and parish choir director at Borgo San Giacomo, and other nearby churches in Brescia.